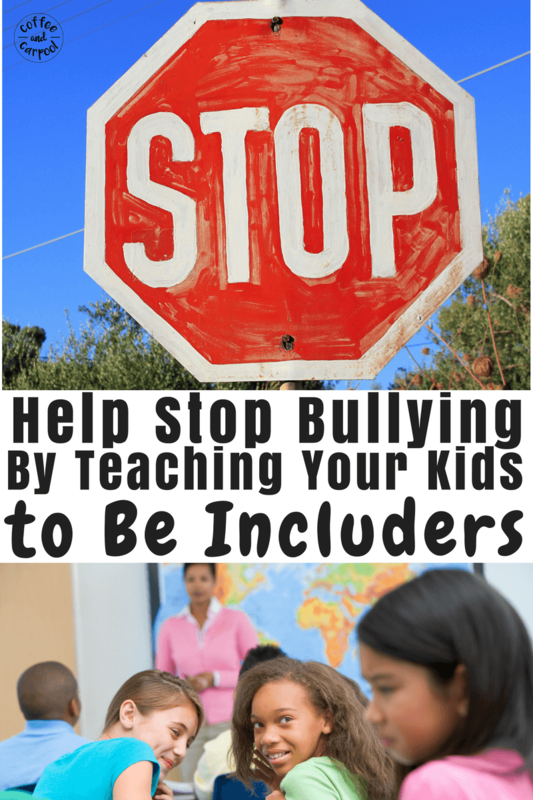 Inside: Kids can prevent bullying by teaching them how to be includers and invite kids to join in. My daughter was playing alone on the jungle gym at school. Again. My daughter, who has low vision, was so traumatized by it, she never even told me it happened. She was too embarrassed. I was in the dark that a 10-year-old girl had used my daughter’s special needs against her. And while that was just one of many bullying incidents my daughter faced, most of the times she was bullied, it was when she was alone. When she had no one to stand up for her or speak up for her or shield her from the pain of it all. My daughter was the new girl at the school and wasn’t in any cliques. She had no groups of friends. So she spent a lot of time alone. On top of being the new kid, her low vision prevents her from finding the few friends she had made when they’re all out on the playground. So she spent even more time alone. And bullies focus on the kids who are alone. They go for the easy target. A lone kid on the playground searching to fit in but playing off by themselves fits the bill. So how do we help kids who are alone? Help kids who sit alone? Help kids who play alone? And how can we bully-proof our kids? There’s a simple solution I actively and purposefully teach my kids which helps prevent bullying and also emotionally and socially protects kids who are alone. There is much confusion over the definition of bullying and what is teasing and what is meanness and what is real bullying. But the clearest definition is: Bullying is deliberate and repeated aggressive actions that involve a real or perceived imbalance of power or control (physical strength, popularity or the knowledge of embarrassing information). 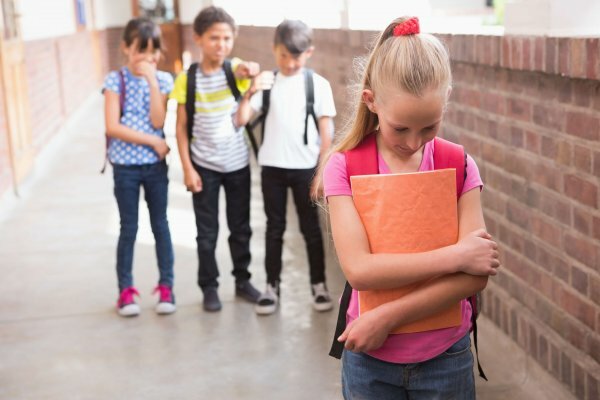 One of the most common bullying tactics-especially amongst our girls-is social bullying, in the form of social exclusion. What is social exclusion? It’s our generation’s version of the cooties, but with an added cruelty to it. It’s purposefully excluding someone, avoiding them, or telling others not to play with them. It’s spreading rumors about another person. It’s “I won’t be your friend anymore if you are their friend” crap. And social bullying stings as much, if not more, than being physically assaulted because it drastically affects our kids’ mental health. It can lead to severe depression, angst, embarrassment, and anger. And as parents, we have to know how and when to emotionally protect our bullied children. But there’s also a way to help prevent bullying in the first place. None of us wants to raise mean kids. We want our kids to be kind. But sadly, that’s not enough anymore. It’s not enough to tell kids what not to do: don’t be mean, don’t name call, don’t bully. We have to actively and purposefully teach them what to do instead. Our kids need to know they can have a positive and powerful roll in someone else’s life when they include, invite, and welcome others. They have to know that by asking one simple question- “Do you want to sit with me?” or “Do you want to join us?” or “Can I play with you?“—brings people together. And this is the highest form of kindness and compassion. And it’s contagious. When our kids are welcoming, their peers will start to include others too. And if they can only help just one kid who otherwise feels isolated or lonely, not only are they providing them with a sense of friendship and inclusion, they’re also actively preventing bullying. *Disclaimer: Our kids do not need to be friends with everyone. They do not need to befriend a kid who makes them feel unsafe. They are not responsible for connecting with every kid. But they can make a difference for one or two or ten classmates they just don’t know well yet. 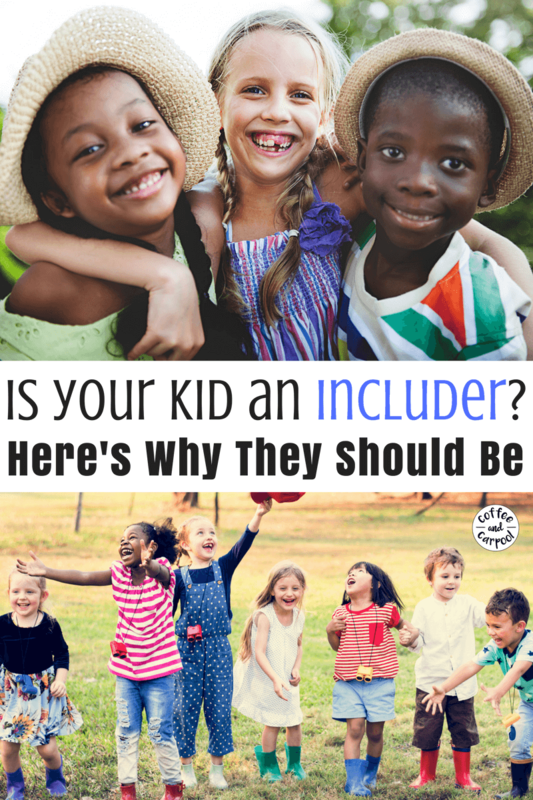 They can be the welcoming committee and be friendly to all, especially kids who are new or are different-abled like my daughter. Since bullies tend to target kids who are alone, kids can work together to reduce the number of kids standing by themselves. It’s a simple way to protect kids from being targeted. The kids who are alone need someone to sit next to. Someone to eat with. Someone to stand near at recess or at lunch. They need a support system in order to feel safer. They need a group of kids, or even one kid, who invites them to join in. They need an includer. And that kid can be your kid. Being an includer is simple. It’s pausing what you’re doing, looking around, realizing someone is alone, and inviting them to join in what you’re doing. Because inviting someone to join in, welcoming them to a group, including them in a game takes away the self-doubt, the loneliness and the embarrassment that often comes from being alone on a crowded playground. 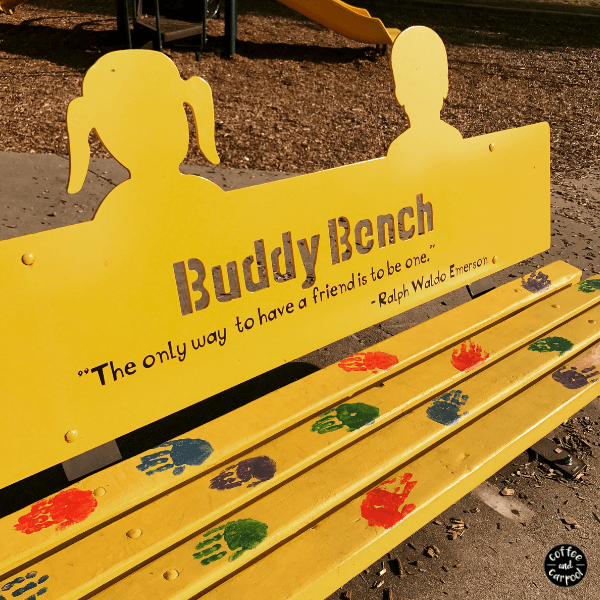 Many schools have Buddy Benches that help let kids know who wants to be invited to join in. But since my kids’ school doesn’t have a bench, I teach them how to stop playing for a minute, look around, and find someone who needs to be included. Because all it takes is an invitation. To help my kids remember to do this at school, I send these kindness lunchbox notes to school with them. 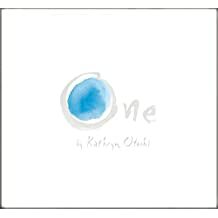 We read books like One and read these must have kindness books. 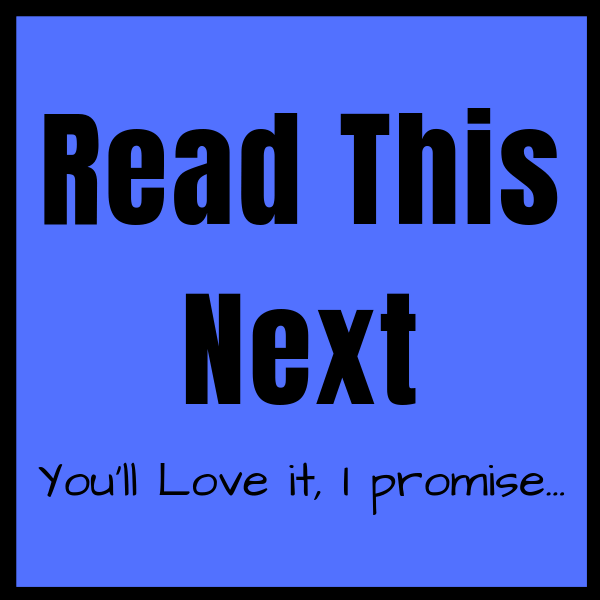 And we discuss how to include others with these 60 Kindness Discussion Starters. Because one invitation makes kids who are alone feel like they’re part of a group and not the only alone person. One person can make all the difference in the world to the lonely, bullied kid. It’s bully prevention in it’s simplest form because standing next to someone has power. Being part of a group—even if it’s a group of two kids—feels safe. And feeling safe is priceless.